Choose FHYAA as one of your charities! We Appreciate the Ft. Hunt Sportsmen! 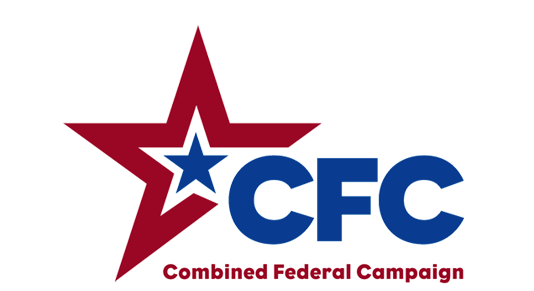 The 2018 Combined Federal Campaign (CFC) is currently open. For the first time, this year you can choose Forth Hunt Youth Athletic Association as one of your charities. Money donated to FHYAA through the CFC will go to serve all of the FHYAA sports and help us continue our mission of improving our sports programs and expanding the opportunities we provide for the children in our community. If you're a federal worker or retiree, or a government contractor, you are eligible to donate to the CFC. We hope you will consider listing FHYAA as one of your charities. Winners of the 2018 Jackson Casey Memorial Scholarships are presented their $3,000 scholarship checks at Carl Sandburg Middle School on June 18, 2018. 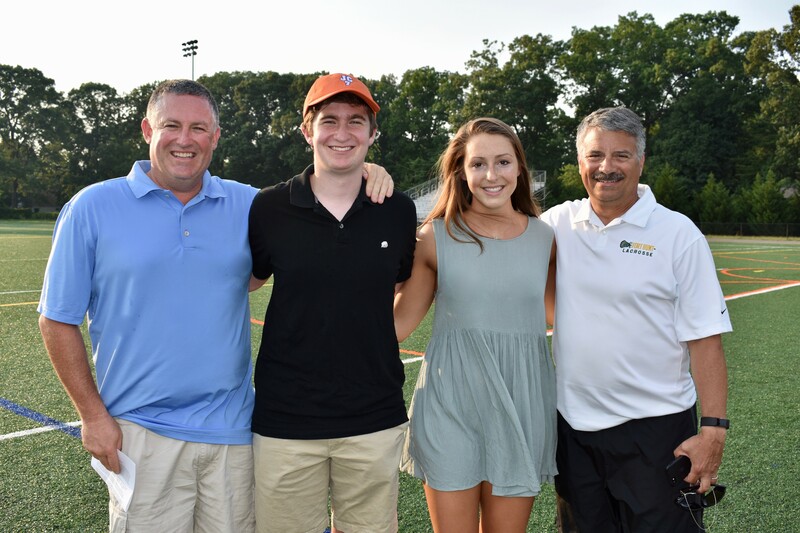 From left are Sean Casey, Seth Lewis from West Potomac HS, Caleigh McDonough from Georgetown Visitation Preparatory School, and John Stamos President of FHYAA. The Fort Hunt Youth Athletic Association announced the winners of the 2018 Jackson Casey Memorial Scholarships. The scholarships are in memory of Jackson Casey, a FHYAA athlete who died in 2011. Jackson participated in lacrosse, basketball and football and was a good teammate and friend to many. Jackson’s legacy, talent and sportsmanship will forever be remembered by those he touched. Caleigh McDonough, a Georgetown Visitation Preparatory School graduate, will attend University of Virginia in the fall. Caleigh participated in a number of Fort Hunt sports including Lacrosse, Basketball (County team and House), and Volleyball. She has served as Head Coach/Assistant Coach in Volleyball and Head Coach in Basketball. She has also served as both Referee and Referee Supervisor for Volleyball. Seth Lewis, a West Potomac High School graduate, will attend University of Virginia in the fall. Seth participated in Football, Lacrosse, and Basketball. Seth also committed his time as Head Coach in Basketball for Junior High kids. “Not only are these special young adults, but it was a joy reading about how sports and competition shaped their lives,” said Sean Casey, the father of Jackson Casey. The two winners were selected from a pool of applicants, all of whom were asked to describe in 750-1,200 words the life lessons they learned through their participation in Fort Hunt youth athletics. Applicants were required to have participated in an FHYAA sport at some point in their career. Applicants came from six area high schools and represent 13 colleges from coast to coast. Winners of the 2016 Jackson Casey Memorial Scholarships pick up their $3,000 scholarship checks. 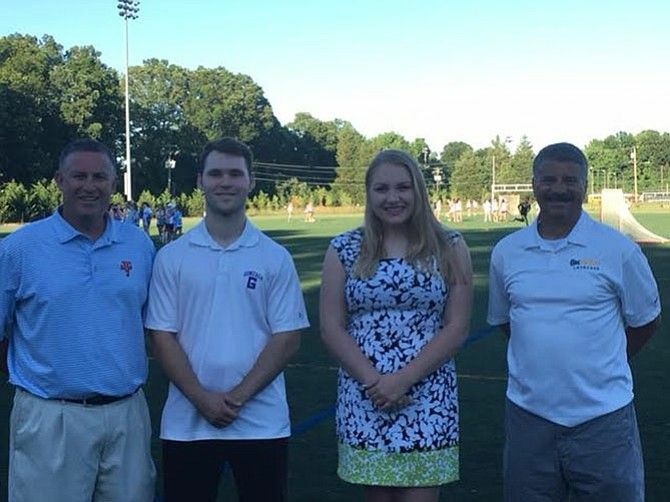 From left are Sean Casey, Henry Chastain from Gonzaga College High School, Jessica Dorn from West Potomac HS and John Stamos, President of FHYAA. The Fort Hunt Youth Athletic Association announced the winners of the 2016 Jackson Casey Memorial Scholarships. The four winners were selected from a pool of applicants, all of whom were asked to describe in 750-1,200 words the life lessons they learned through their participation in Fort Hunt youth athletics. If you do not have any children that are registered to play a FHYAA sport, but you plan to volunteer to Coach or Assistant Coach for that sport, you must complete the Volunteer Registration process for the sport you plan to coach.